Made from 70% Grenache Gris, Grenache and 30% Mourvèdre grapes harvested by hand from 65 and 80 year old vines, this is a visual beauty of the palest salmon. Jean-Marc Lafage makes this at his estate near Perpignan, France. The grapes were lightly pressed and fermented with indigenous yeast, but the pale colour comes from the free run juice. Most was aged in tank, but some was actually aged in oak which helps explain the great body. Aromas show light strawberry with green shoots and honeysuckle. The palate is dry with great acidity and a supple, buttery mouthfeel. Flavours show salmon berry and strawberry juice with jasmine and honey. WSET Very Good – usually rosés are bitter and have little body. This one is not usual though – and offers a beautifully rounded body with not a hint of bitterness. It’s expensive for the BC market, but well worth it and comes with a glass stopper. 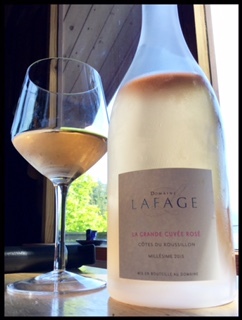 This entry was posted in France, Grenache / Garnacha, Grenache Gris, Mouvedre, Monastrell, ROSE and tagged 13% abv., Cotes du Roussillon AOP, Domaine Lafage, france, La Grande Cuvée Rose. Bookmark the permalink. Good to know, I was looking for a new Roseto try!